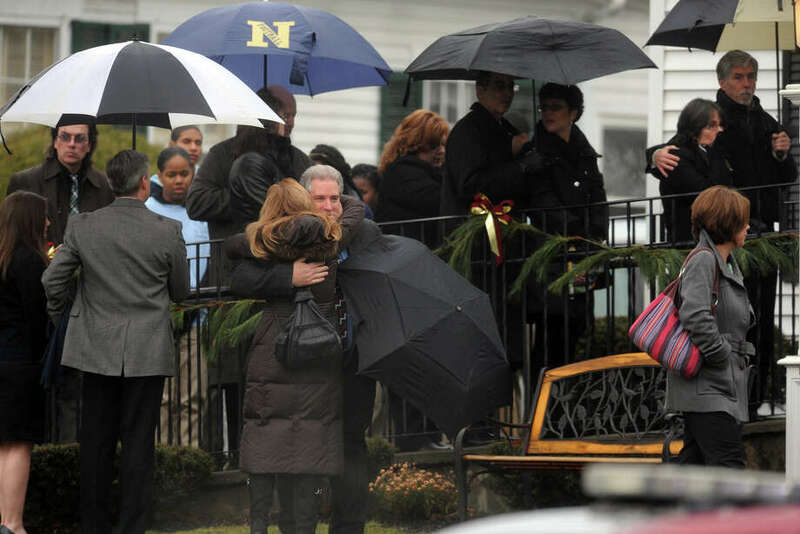 Mourners arrive at Honan Funeral Home, in Newtown, Conn., for the funeral of Jack Pinto, 6, on Dec. 17th, 2012. Pinto was one of 20 students killed at Sandy Hook Elementary School last Friday. NEWTOWN -- Mourners waited in a chilling drizzle Monday to say goodbye to 6-year-old Jack Pinto, the first of 20 children and six adults to be laid to rest after they were murdered Friday at Sandy Hook Elementary School. Hundreds of men, women and children, many appearing no older than the brown-haired, first-grader who loved wrestling and idolized New York Giants wide receiver Victor Cruz, stood patiently in line at the Honan Funeral Home, sharing quiet conversations, umbrellas, and even coats, before filing past his tiny, ivory casket. Scores of television and newspaper photographers lined Main Street opposite the funeral home, a three-story, white clapboard building with black shutters, where the viewing took place, while a young people's choral group sang hymns. Jack was buried at the Newtown Village Cemetery, wearing a white Giants jersey bearing the red number 80, the same number worn by Cruz, and with a gray-and-white stuffed fish nestled in his left arm. The interior of the funeral home was filled with photos of Jack eating chocolate ice cream bars with his brother, laughing, playing, and a close-up image of him with a blue "NY" tattoo on his cheek representing the football team. Among the youngsters paying their respects were friends from the Newtown Youth Wrestling Association -- Jack was one of the youngest members -- wearing gray jerseys, and football teammates clad in dark blue uniform tops. "Jack, I'm glad you were my friend," one youngster wrote in the guest book, which visitors signed as they entered the funeral home. An ambulance and paramedic were summoned to the funeral home shortly after 1 p.m., but left without transporting any patients. About 100 family members and friends attended the grave-site service at the cemetery, situated on a rolling hillside less than mile from the funeral home. Jack's parents, Dean and Tricia Pinto, and both sets of grandparents choked back sobs as clergyman said prayers. Others, including the boy's former baseball coach, delivered brief eulogies. "Jack was the boy that everybody wanted on their team," said Shari Butler, who helped coach his baseball and basketball squads for the past two years. He could make every catch, hit every ball and "put his heart into every throw," Butler said. At the same time, services for a second victim, Noah Pozner, were being held in Fairfield. Pozner, also 6, was buried at the B'nai Israel Cemetery in Monroe.